Would you pay an extra $50 for a pint-sized tablet if it ran Windows 8 instead of Android? Asus thinks you might. 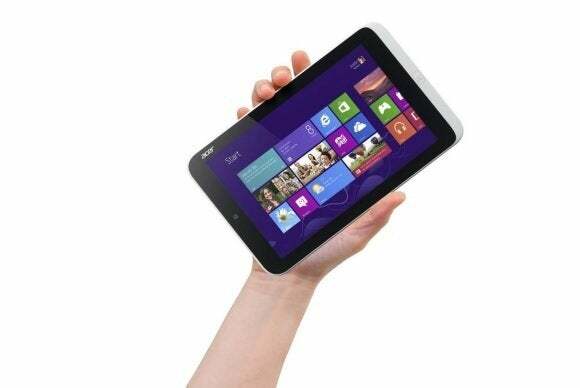 The Taiwan-based electronics maker plans to release a smaller Windows 8 tablet later this year, Asus CEO Jerry Shen recently told The Wall Street Journal. Shen also expects the new Windows 8 tablets to hit prices below $300 to better compete with cheaper Android-based tablets such as the Nexus 7 and Amazon’s Kindle Fire. Microsoft began paving the way for sub 10-inch Windows 8 tablets in March by slashing licensing fees for Windows and Office, and reducing screen resolutions for official Windows hardware requirements. Windows Blue, a Windows 8 refresh expected to roll out as Windows 8.1 later in 2013, is also expected to feature enhancements more suitable for small-fry tablets. Most notably, Windows 8.1’s Snap feature is expected to work with resolutions as low as 1024-by-768; the current version of Snap requires a minimum 1366-by-768 resolution. Snap is a Windows 8 feature that allows two modern UI apps to be viewed side-by-side. Microsoft’s partners are also working towards a mini Windows 8 tablet revolution. Intel is prepping new Bay Trail Atom processors using the new Silvermont microarchitecture that could pave the way for $200 Windows 8 laptops and tablets. Microsoft is reportedly working on its own 7-inch Surface tablet, Amazon recently leaked an 8.1-inch Windows 8 tablet from Acer, and now Asus is excited to join the mini-Windows fray. While Amazon may have tipped Acer’s hand a little early, it appears most manufacturers are waiting for the Windows Blue refresh with features better suited to smaller tablets before rolling out new devices. What’s not clear, however, is whether those companies will load baby tablets with Windows 8 designed for x86/x64 processors or the ARM-based Windows RT. Given the longstanding WinTel alliance between Microsoft and Intel, and the struggles to move Windows RT devices off store shelves, it’s a good bet the first round of mini-Windows tablets will use Windows 8. Samsung earlier in the year scaled back global distribution of its RT-based Ativ Tab slates. And Acer recently said it would wait to see the Windows RT refresh later in 2013 before deciding on whether or not to release an RT tablet. Acer originally planned to release an RT tablet before June, but cancelled those plans after RT sales proved to be a disappointment for other PC makers. Market research firm IDC (which shares the same parent corporation as PCWorld) recently said a paltry 200,000 Windows RT tablets were sold during the first three months of 2013. “To be honest, there’s no value doing the current version of RT,” Acer President Jim Wong said Friday. In the meantime, Acer says it will focus on Android and Windows 8 devices. Microsoft and PC makers are clearly excited about the possibilities smaller Windows 8 tablets could offer, but it’s anybody’s guess whether mini-Surface tablets and baby VivoTab slates would fly off store shelves. Would these tablets include access to an impossibly small traditional desktop loaded with Office 2013 in an attempt to boost sales? Are modern UI versions of Office for touch devices on the way, as some rumors suggest? Nobody knows for sure. One thing’s for certain, however: The rest of the year is going to be an interesting time for Windows tablets.